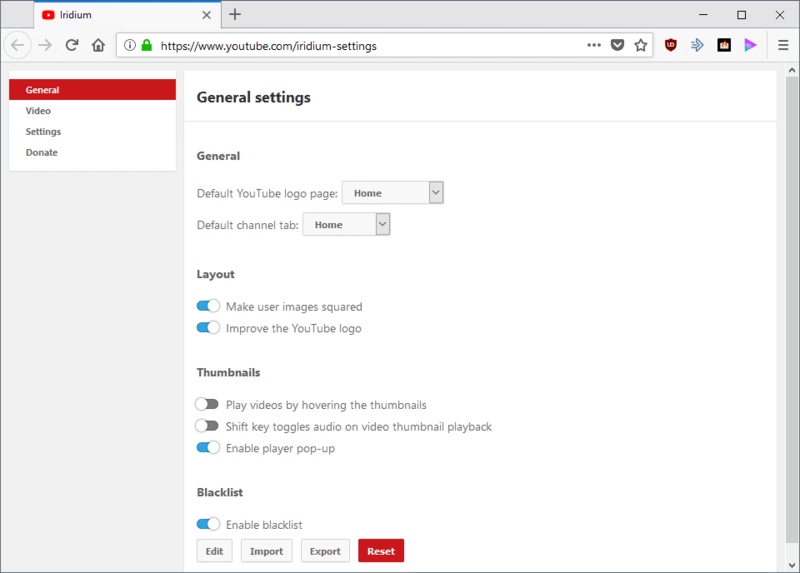 Iridium is an open source browser extension for Google Chrome and Mozilla Firefox that gives you more control on YouTube. YouTube gives users only a handful of customization options and many of those are not remembered over sessions or when you don't sign in to an account. Iridium is a well-designed browser extension that gives you dozens of customization options, from setting the default video quality to remembering the volume level or enabling loudless normalization. Note: Iridium has nothing to do with the privacy-focused Chromium version that is also called Iridium. Iridium requests access to YouTube's domain only and does not request any other permissions. 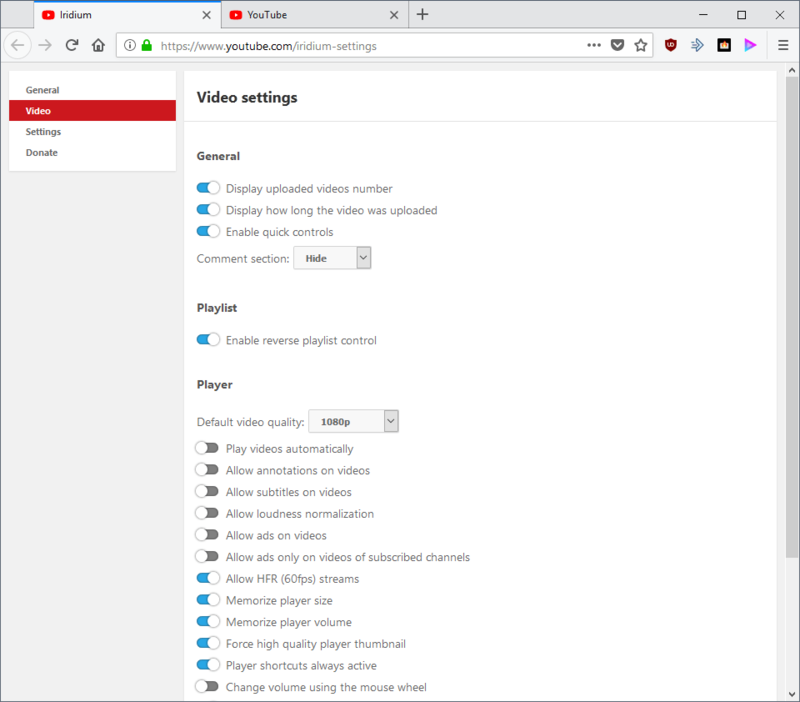 The extension adds an icon to the browser's toolbar; activation opens the settings of the extension so that you can start configuring YouTube to your liking right after installation. Settings are divided into the four sections general, video, settings and donate. General controls only a handful of settings but they are quite useful nevertheless, and Video is the section that holds most of the options. You can set the default channel tab (Home, Videos, Playlists, Channels, Discussions, or About) there, control the blacklist, or enable audio playback when you hover the mouse over a video thumbnail and press the Shift-key on the keyboard. Video controls most of the available preferences. You may have seen most of the settings in other YouTube extensions for Firefox or Chrome but Iridium supports some that appear to be unique. You can set the preferred video quality to all supported quality levels (between 144p and 8k) and make sure that features that the extension enables by default are set correctly. Iridium remembers the default player size and player volume by default, makes sure that player shortcuts are active all the time, and enables support for HFR streams. Other features are disabled by default. The extension blocks annotations and subtitles by default, and makes sure that videos don't play automatically either. Comments are not displayed but hidden. You have full control over all features and may toggle them at any time in the configuration. Iridium supports a handful of interesting features that are rare or unique. The extension blocks advertisement by default but you may enable ads on channels that you are subscribed to; useful if you want to support creators this way. The extension displays the video in a smaller overlay when you scroll down so that it remains visible all the time; handy as well if you like to browse comments while watching videos. Last but not least, you may enable the modified locale feature to set YouTube to a specific locale. All supported features are explained on the project's GitHub page. A click on the question mark icon next to a setting opens its description on GitHub so that you know what it does. Iridium displays controls on Youtube directly next to that. When you hover over video thumbnails you get options to block the channels that published the video by clicking on the x-icon that is displayed, and to play the video in a popup. Iridium is a powerful browser extension for YouTube that gives you more control over videos and other features of the site. While you may need to go through the configuration on first start to make sure everything is set up the way you want it, it is pretty straightforward and you get explanations in case you don't know exactly what a feature does. Now You: Do you use a YouTube extension? Interesting to see this out, finally. This is by the guy that does Youtube Plus, which was the best of the Youtube extensions, until it dragged behind on a release for the new interface. Enhancer For Youtube has been the best for a while, for the new interface, so it will be interesting to take a look at this and see how they compare. I do think it is a major drop-off, name-wise, though. Going from Youtube Plus to a name that has nothing to do with Youtube is kind of silly. I would have renamed Youtube Plus to Youtube Plus Classic and kept the old name for the new extension. That or just add a 2.0 to an already good and established name. I’m completely guessing here, but maybe the developer was considering possible branding issues in the future, so they decided to omit the use of “Youtube” in their titles, to avoid any legal issues. It is indeed the case as explained here: https://github.com/ParticleCore/Particle/issues/504. Specifically, “the Opera add-on store did not accept the YouTube name in the extension”. Ah. Good to know, though it doesn’t really matter much in the long run, for me. It isn’t better than Enhancer (At this time. ), as per my own testing. On top of that, the guy dragged it out for so long, for the new interface, that I would rather stick with something that I know will keep up. I would imagine we would be right back to square one, with waiting, any time Youtube has any major changes. It was by far, the slowest, of the main options, to keep up. Also worth noting. He seems to have way more problems than other developers. The mining, the dragging things out, and the name problem, when the others don’t have miners, kept up with no problems, and plenty of “Youtube” named extensions remain on both Chrome and Opera stores. It always worries me when you see one developer have everything bad going on, but every other one seems fine. I used Plus for a long time and even kept the old interface on Youtube for a long time. Eventually, enough was enough and I made the switch. It’s from the dev who has implemented bitcoin mining in his extension. Yes, you can opt out, but… I don’t think it’s a reputable decision from him. I read about this a while back, so it’s an opt-out in Iridium or is it a different case here? Bitcoin miner was a userscript exclusive “feature”, browser addons of Iridium didn’t have it as per Mozilla and Google policies. I think originally it was an opt-out when it was first implemented to test it and then changed to opt-in (disabled by default). But recently the miner was removed from the userscript so all Iridium versions are clean now and you can only donate via PayPal. There was another incident with this developer involving his previous Youtube addon (YT+). He sold his Chrome extension to a 3rd party without alerting the users and that 3rd party embedded malware/ads into it. From what I remember, Firefox extensions and userscript were clean from malware since he only sold the Chrome extension. People got angry and dev didn’t take it very well so there was some arguing on his github page, and then there was a lot of arguing over the bitcoin miner in Iridium as well but everything seems fine now. This extension attempted to allow crypto currency mining as an ‘aternative donation method’. Seems like the author is more desperate for remuneration than perhaps is ideal for users. I may give this ‘Iridium’ Firefox extension a try though I prefer scripts when possible. At this time only one Youtube jscript, YouTube HD at https://greasyfork.org/en/scripts/23661-youtube-hd, which handles the video resolution and the video player size. I’ve always been bothered by two settings I couldn’t keep without a YouTube cookie, the dark mode and the no-autostart option, both off by default. I found a css style which handles the former and a userscript the latter. That was until this very morning. I’ve been going back and forth between two Firefox extensions handling cookies : ‘Cookie AutoDelete’ and ‘Forget Me Not’, trying to find the best equation for my purpose. You can create rules for cookiename and domain combinations. I applied the cookie specific expression accordingly by adding pref@youtube.com to my ‘Forget Me Not’ rules as White (keep and keep after closing browser) and it works perfectly : YouTube cookie is wiped at the exception of my preferences which include dark-mode and no-autostart. Mentioning this for whom may be interested, not to glorify myself nor an extension. Now, about ‘Iridium’, as I said I may try it but I admit that Karl O.’s comment above is not an incentive. Thanks for pointing out Forget Me Not. I’ve been looking for a replacement of CookieKeeper, which let you keep specific cookies, html5 storage, flash LSO cookies, and a whole lot more advance features. It was so much better than anything available today. It’s a pity Firefox is neutered so much that something as advance as CookieKeeper is imposible to recreate. @Tom Hawack: for blocking autoplay I use the extension “Disable autoplay on YouTube”. Works fine. Can anyone that has installed it answer, does it have an option to display a stop button in the Youtube player? I couldn’t see it listed on the website, but like having this feature which currently I get via another extension, but would like to drop it for this but don’t want to have to use both. Thanks. @yogaisevil: thanks for mentioning the userscript. After installation there is nowhere you can adjust the settings though. Do you have any idea? Update: when you are on YouTube, there is an Iridium button on the top right of the screen. Click on that to adjust Iridium settings. I am greatful for this site and its wide variety of information and opinions. I did not know about this add on developer being a “somewhat” crypto miner and I would never have figured it out myself. So thanks for the info about it. Better be safe than sorry. Only speaking for myself, if others like Iridium, fine with me. 1) The miner is opt-in, not opt-out. 2) Its existence is explained right in the readme. 3) It is available only in the script version. Extensions don’t have it. It’s not something you ought to worry about. Thank you very much for the details. It should honestly be included in the article because it will put a lot of minds at ease. Martin, please illustrate this point in article. Amazing extention. Thank you for pointing out to it! I’ve tested this before and found it to be a gimped version of the original project and it failed to work for me on Pale Moon however Youtube ++ seems to work fine. This extension’s predecessor was missing one thing though: the ability to set a default playback speed. So is this descendant, which makes sense, since if they couldn’t do it with the old, more powerful extension system, they won’t be able to with the new system. I’ve tried the best-known separate extension that’s supposed to do it, but gave up on it. It didn’t work well. “Enhancer for YouTube” has the ability to set a default playback speed and a whole lot more. I especially like being able to choose 4 preferred qualities (in order) rather than just HD. It’s my favourite of the YouTube addons. Gets updated quickly when YouTube changes things. – When clicking in a time for the video in the description/comments, I don’t want to back to the top. It would be good to click the time and the video keeps minimized.